Product #46557 | SKU BKA127SA | 0.0 (no ratings yet) Thanks for your rating! Nikon designed the 6x20 Coolshot 20 Laser Rangefinder to measure the distance to flagsticks up to 250 yards away, and reflective targets up to 550 yards away. It features First Target Priority mode that automatically displays the distance to the closest target sighted when overlapping subjects are viewed, and can perform single or 8-second scan measurements. The 6x magnification is suitable for identifying targets at mid-range distances and a long eye relief helps eyeglass wearers use it comfortably. Information is displayed in an in-view display and an auto-off function saves battery life. 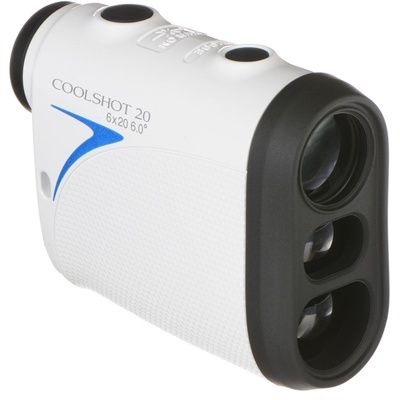 Multicoated optics, weatherproof construction, a wide temperature tolerance, and one-touch activation make this rangefinder a full-featured device for many activities, such as golf, where determining accurate distances are critical.